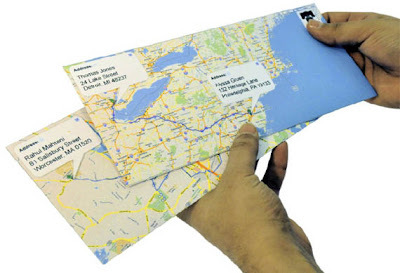 Google Maps envelopes (only a concept at the moment) would let you send snail mail through a button right in gmail and print evelopes showing the route between the two addresses. This is crazy...and I love it! Any idea if we are really headed in this direction? Ha ha...no pun intended. I'd love to send snail mail in these envelopes!